Alexander Sergeyevich Pushkin was a Russian author of the Romantic era who is considered by many to be the greatest Russian poet and the founder of modern Russian literature. 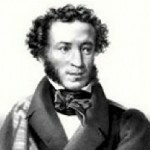 Pushkin published his first poem at the age of fifteen, and was widely recognized by the literary establishment by the time of his graduation from the Tsarskoye Selo Lyceum. While under the strict surveillance of the Tsar's political police and unable to publish, Pushkin wrote his most famous play, the drama Boris Godunov. His novel in verse, Eugene Onegin, was serialized between 1825 and 1832. Notoriously touchy about his honour, Pushkin fought a total of twenty-nine duels, and was fatally wounded in such an encounter with Georges-Charles de Heeckeren d'Anthès. D'Anthès, a French officer serving with the Chevalier Guard Regiment, had been attempting to seduce the poet's wife, Natalya Pushkina. Pushkin's early death at the age of 37 is still regarded as a catastrophe for Russian literature.